So, the New Year is here, and you’ve decided to take the plunge. This year, you’re finally going to learn another language. That’s great – speaking a second language can help you get jobs, make you better at understanding your own language, strengthen your memory, and can even protect against certain diseases, such as Alzheimer’s. But it is an ambitious goal. 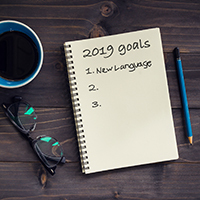 So, to ring in the New Year, here are some of the best methods you can use for learning a new language and sticking with it, so that once February rolls around and you stop going to the gym five days a week (we all do – running is hard! ), your language goals don’t fall by the wayside. Here’s to a happier, healthier, more language-rich 2019! This may sound silly, but if your motivation for learning Japanese is to impress your mono-lingual friend group during a night out, you probably won’t get very far. Knowing your motivation gives you a specific, tangible objective to work towards, and will help keep you on track once the honeymoon period of language learning is over and the idea of having to grapple with the pluperfect tense again is enough to make you start pulling your hair out. If you don’t have a clear motivation, spend some time coming up with one. Maybe you love the book One Hundred Years of Solitude and don’t want to die before you’ve read the original Spanish version. What about that trip you’ve always wanted to take to Egypt? Tell yourself you’ll finally book your ticket the day you can read the front page of the Al-Ahram newspaper without having to look up a single word. Write your motivation down. Put it up on your wall. Start studying! Setting your language goals with a friend will not only give you a healthy sense of accountability, but it will provide you with someone with whom to regularly practice speaking in your target language, the importance of which cannot be stressed enough. Not to mention, adding a dose of competition to the language-learning game may help you bump those twenty-minutes of daily flashcard review up to twenty-five. Once you’ve got your goals set and someone to study with, do some research on your target language. Languages are not all built the same way and thus, there is no one-size-fits-all in terms of learning methodology. How phonetic is your language? If it’s highly phonetic, meaning that each letter equates to only one sound, as in Turkish or Spanish, go ahead and opt for a traditional learning method that teaches pronunciation and spelling together. If your target language is not very phonetic, like French or English (yes, English speakers, our language is not phonetic – that’s why words like ‘air’ and ‘heir,’ or ‘ceiling’ and ‘sealing’ are spelled differently but sound the same), you may want to try an audio-based learning approach. Audio-based approaches teach learners the pronunciation of words before showing them how those words are written, which helps to avoid issues that arise when learners attempt to divulge a word’s pronunciation from its (often illogical) spelling. Additionally, you’ll want to think about your own language background. If you’re learning French or Portuguese, but you already speak Spanish, look for a program that’s made for Spanish-speakers, rather than English speakers. French and Portuguese are similar enough to Spanish that a lot of learning will be much more intuitive for you than for other English speakers; if you take a course or use an app that’s made for English-speakers, you’ll find yourself far outpacing your peers and probably pretty bored. Be sure to find a program that allows you to start learning from the level that you’re at. If you already know a decent amount of French vocabulary and grammar, being forced into a beginner’s class is a good way to bore you into quitting. In general, programs that allow for a high level of customization are going to be the most effective. At ALTA, for example, language training includes an initial evaluation of student levels, and each student or group’s course of study is customized to their language-learning goals, including the level of fluency that they are looking to attain, and the area of study in which they would most like to focus, whether it be spoken fluency, or proficiency in reading and writing. You can do all the language study you want, but if you’re not working to build fluency outside of repetition drills or singing along with your favorite Reggaeton song, you’re just never going to get there. Luckily, over the last few years, free language exchange meetup groups have become staple events in cities all over the world. And they’re the perfect places for you to let all of your fears of making mistakes fall by the wayside – everybody at these events is a language learner making mistakes, so they get it. It’s also a good idea to look for language programs that include regular opportunities for conversing with native speakers. This might sound strange, but watching the way people’s mouths move can help you both with comprehension and pronunciation. Different languages make different demands on the lips, tongue, and vocal chords, and just watching people’s mouth movements is one of the best ways to start tuning into these differences. In fact, one study showed that infants in bilingual households tend to spend more time focused on speakers’ mouths versus their eyes, differing from infants in monolingual households. If you don’t know any native-speakers, TV and movies can serve as a good substitute on this one. Other useful tools for pronunciation practice include Mimic Method courses, which explain exactly the position that your tongue, teeth, and lips should be in order to properly pronounce tricky words or sounds, or the Forvo app, which you can use for minimal pair training, the practice of training yourself to differentiate between sound nuances that don’t exist in your own language. Forvo allows you to download sound files of words you want to be able to tell apart (i.e. sheep and ship or cheap and chip can be tricky for native Spanish-speakers, L and R sounds for Japanese-speakers), and then you can use Anki to create a matching game between sound files and the words they correspond to. The best way to retain material is to go back over it periodically, even when you feel like you’ve moved so far beyond it that it seems too basic for review. It is totally possible to become so fluent in a language that you know medical and legal terminology but can’t remember the word for step-mother! Although you might not know it, your brain is already a great vocabulary builder. When you read or listen to something, your brain is not actually taking every word at face value. Instead, it’s constantly analyzing the frequency with which certain words appear together so that it can anticipate what’s coming next and process speech more quickly and effectively. Neuroscientists have discovered that different parts of the brain light up depending on whether a word makes sense in context or not. So while there shouldn’t be a lot of alarm bells going off if you hear the words ‘coffee’ and ‘cream’ together in a sentence, ‘coffee’ and ‘chromosome’ might make you think you’ve misheard something. In language learners, the frequency and accuracy with which those alarm bells go off changes based on proficiency. The better you are at speaking a language, the closer your patterns of alarm look to a native speaker’s. And the best way to get good at recognizing which words tend to appear together in your target language? Flooding your brain with natural content. That means reading books, magazines, advertisements, etc., etc., and watching lots of TV and movies with the subtitles (in your target language) turned on! Okay, that’s it. Hope you’ve learned a thing or two, now stop reading and get to it!